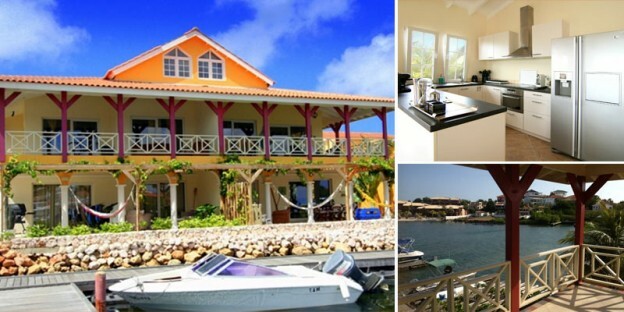 Stylish and spacious waterfront penthouse for sale in Terrasse A La Mer Waterfront Apartments. A lovely place to peacefully enjoy the ever so coveted island lifestyle. A penthouse measures no less than 175m2 of living space. Stairs at the side of the building lead you into an entrance hall that opens into a spacious and bright living room, and glass sliding doors open up to a spacious roofed living porch. The living and the porch offer splendid views overlooking the Spanish Water and toward the Table Mountain. You would enjoy the refreshing trade winds practically all year round, keeping the heat at bay. At the rear of the living you’ll find a luxurious semi-open kitchen including a breakfast bar, an American style double door fridge, microwave/oven combination and a dishwasher. The above mentioned entrance hall of this luxurious home also leads into a full master suite, featuring a private bathroom and walk-in closet. The second bedroom, with private bathroom as well, is also accessible from the entrance hall. From the living room, open stairs lead to a loft, where a third bedroom with private bathroom, and an open study/lounging area are situated. Needless to say all bedrooms are air conditioned. Furthermore, the apartment comes with a separate laundry/storage area. Plenty of outlets for both 110V and 220V appliances are available. All rooms are prewired for TDS television, phone and/or internet connections. All windows and sliding doors are of German fabricate, all windows feature tilt & turn functionality. Residents get to use two parking spaces per apartment. These penthouse apartments are well suited as investment property for long term rent. Demand for quality rentals in desirable neighborhoods like Jan Thiel is high. Please do not hesitate to inquire after homes available for sale and leased for the next few years. Terrasse A La Mer was designed by the renowned architect Jean Pierre Agniel and built by project developers Gert and his son Raymond Bongers. This small scale apartment resort is situated adjacent to the Spanish Water, in the popular residential neighborhood and tourist destination Jan Thiel. Terrasse A La Mer accommodates a total of 11 apartments in two subsections: 4 Waterfront Apartments, and 7 Split Level Apartments. 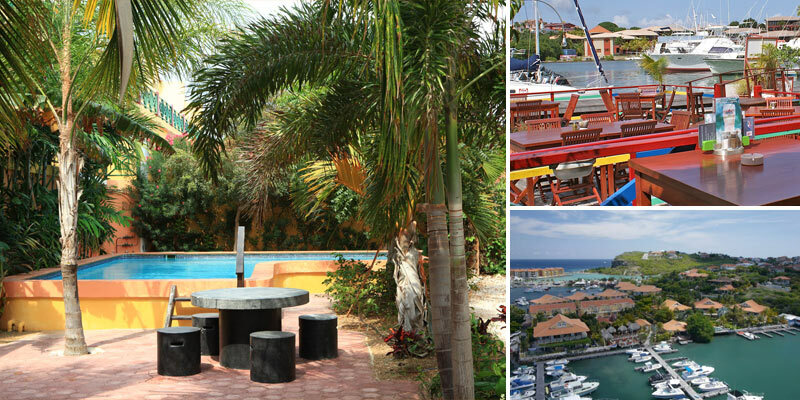 Terrasse A La Mer features lush tropical gardens and a beautifully designed swimming pool. 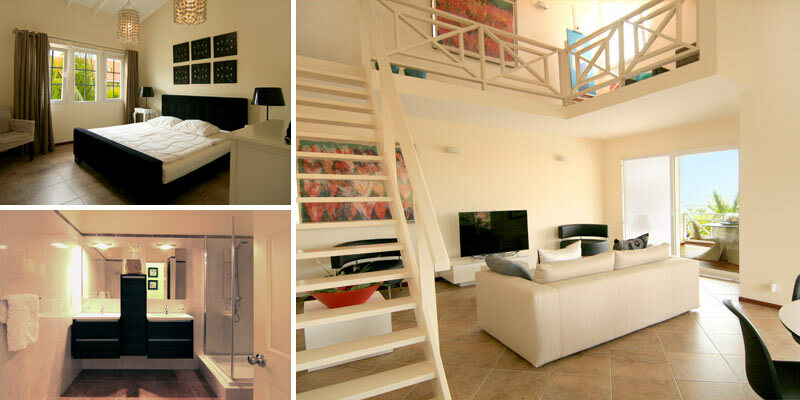 All stylish apartments feature views overlooking the Spanish Water Lagoon. Residents of Terrasse A La Mer Waterfront Apartments get the opportunity to rent a separate garage (subject to availability). A short walk brings you from Terrasse A La Mer Waterfront Apartments to the cozy beach of Caracasbaai, featuring, amongst others, 2 authentic local restaurants. The renowned restaurant De Kleine Wereld is located even closer: next door.